Babblings of a Mommy: My Tide Challenge. Laundry time is always a mission at my house. Everyone has different needs, which means completely different detergents -- from keeping my husbands shirts nice and clean, to trying to remove God-knows-what stains from my daughter's jeans, and of course all my delicate clothes that need extra care. It's exhausting! Luckily, I just found out that Tide now has a My Tide Challenge which tells me which tide best fits all of my needs! My results were Tide plus a Touch of Downy, which gives me outstanding clean with a touch of softness so clothes feel as good as they look. --Perfect! 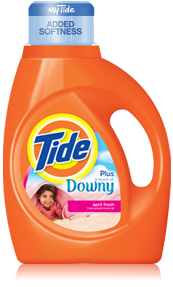 Tide has a cleaning solution designed specifically for your laundry needs. What's your Tide? Take the My Tide Challenge to see what Tide works for you!